I’ve actually never cooked swordfish before – but have always enjoyed it at restaurants. 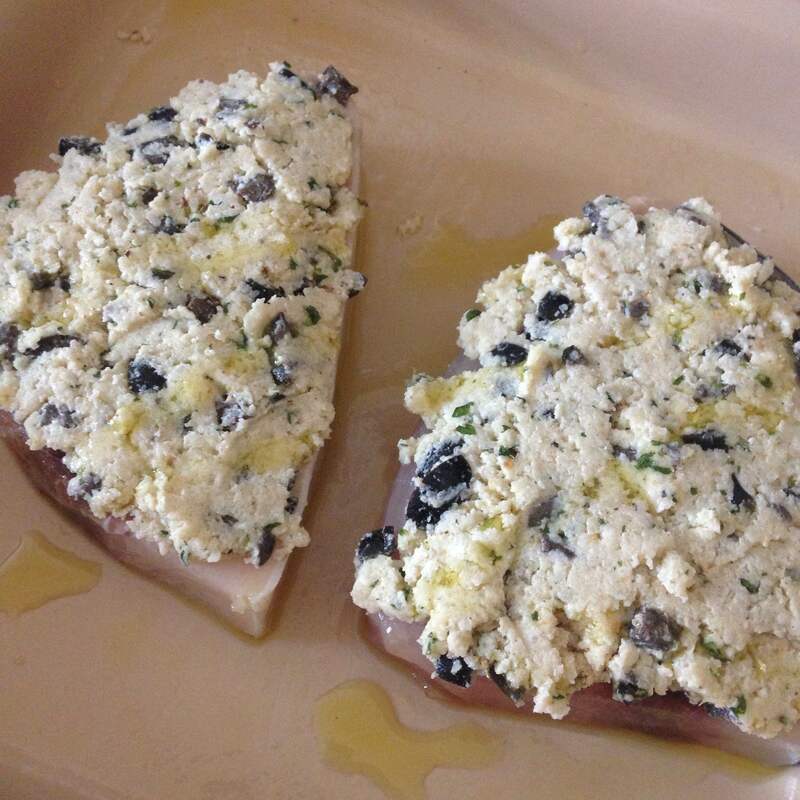 Swordfish is an oily fish so be sparing with the amount of oil you use in its preparation. This twist lends a nod to the Mediterranean with the components of Greek yogurt, black olives and lemon juice in its crust. While the orzo salad bursts with color from the green of fresh spinach leaves and flavor from the juices of the ripe tomatoes. This meal brings me back to memories of dining al fresco seaside in Italy with my family. Seafood there is always so fresh and dishes are clean and light. Pair this meal with a glass of your favorite white wine! I would boil the orzo pasta prior to doing anything and set aside so the pasta is room temperature before you combine the other ingredients into it. I believe ½ Cup Dried Orzo makes 1 Cup Cooked. I made four cups cooked. While the fish is cooking you can prep all the parts that go into the orzo. Chop up the black olives and place in a bowl. Combine the olives with two tablespoons of the Greek yogurt, a cup of the panko breadcrumbs, juice of ½ a lemon, a dash of oregano, garlic powder, black pepper and sea salt. Once combined coat the top of each swordfish piece. The mixture will be thick an sticky so just pat it onto the fish. Take a baking dish and lightly coat with a cooking spray. Place the fish in the baking dish and drizzle olive oil onto the fish. Bake for about 15 – 20 minutes until the fish is cooked through and the crust should brown. Depending on how thick your fish is you may need to bake a bit longer. In a measuring cup combine the following. ¼ Cup of Olive Oil, one tablespoon of Mrs. Dash Lemon Pepper Seasoning, Juice of one lemon, one tablespoon of Dijon mustard. This will be your dressing for the Orzo and once in with the orzo you can also add two tablespoons of the Greek yogurt. Chop up four Campari tomatoes, cut fresh spinach leaves into ribbons. 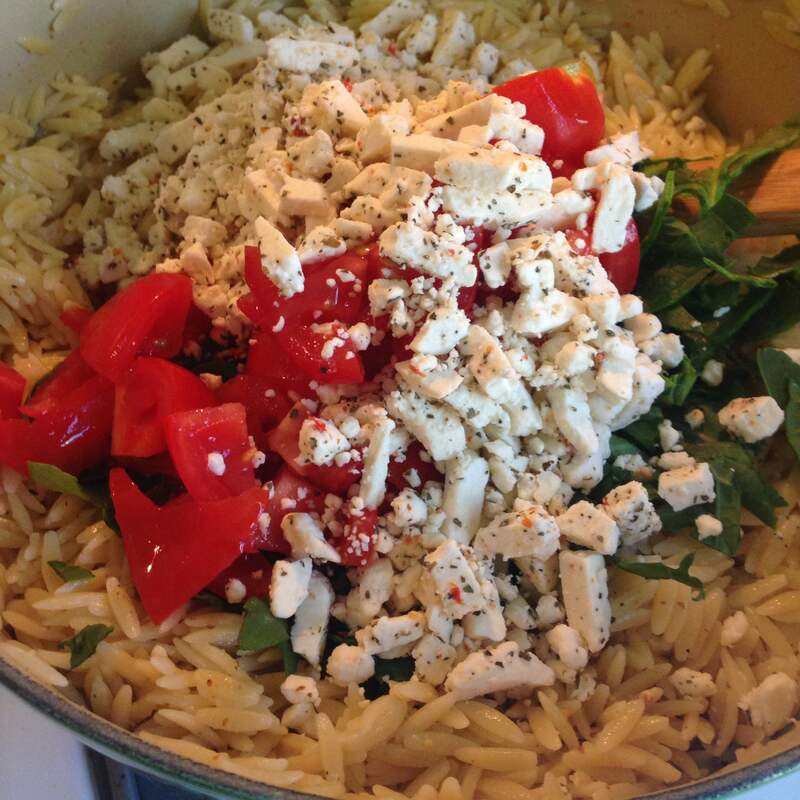 Combine the vegetables along with half a cup of the crumbled feta into the orzo. Add the dressing and the Greek yogurt and mix again. 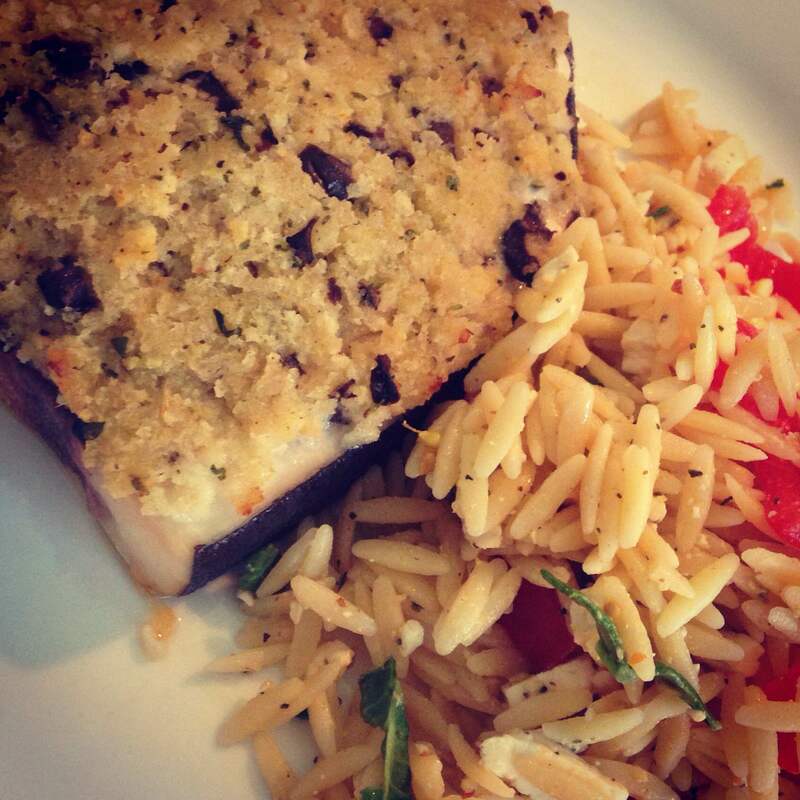 Once fish is cooked – Plate with the Orzo Salad and enjoy with that glass of white wine! © Cookery for Two – 2015 . Unauthorized use and/or duplication of this material without express and written permission from this blog’s author and/or owner is strictly prohibited. Excerpts and links may be used, provided that full and clear credit is given to Cookery for Two with appropriate and specific direction to the original content. Pasta doesn’t always have to be drenched in sauce to be delicious. 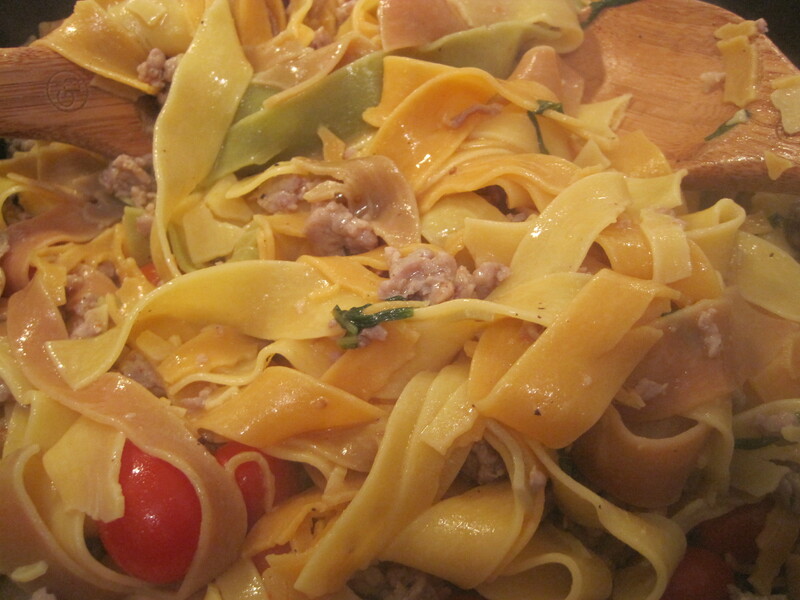 Blistering fresh tomatoes with white wine and olive oil make the perfect light sauce for wide Pappardelle pasta and crumbled sausage. Top with salty feta cheese and you have a perfect plate of pasta. – Let a tablespoon of olive oil heat up in a pan on medium flame. – Have the pasta water (salted) heating to a boil. 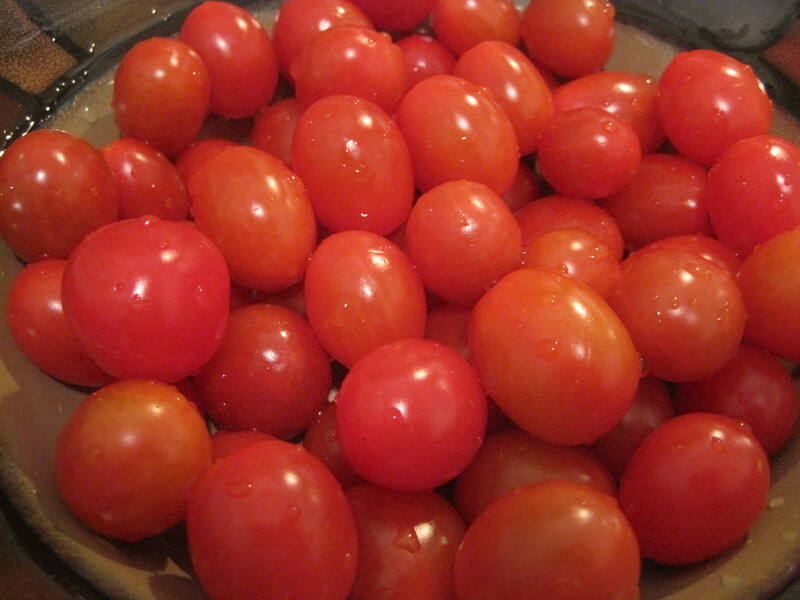 – Wash the cherry tomatoes and a handful of fresh basil then place off to the side. 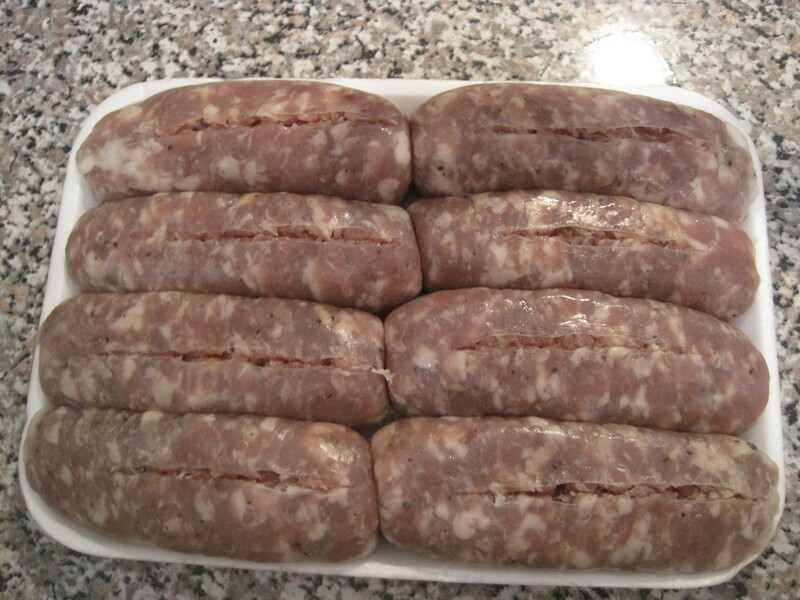 – Cut a line down each sausage link. 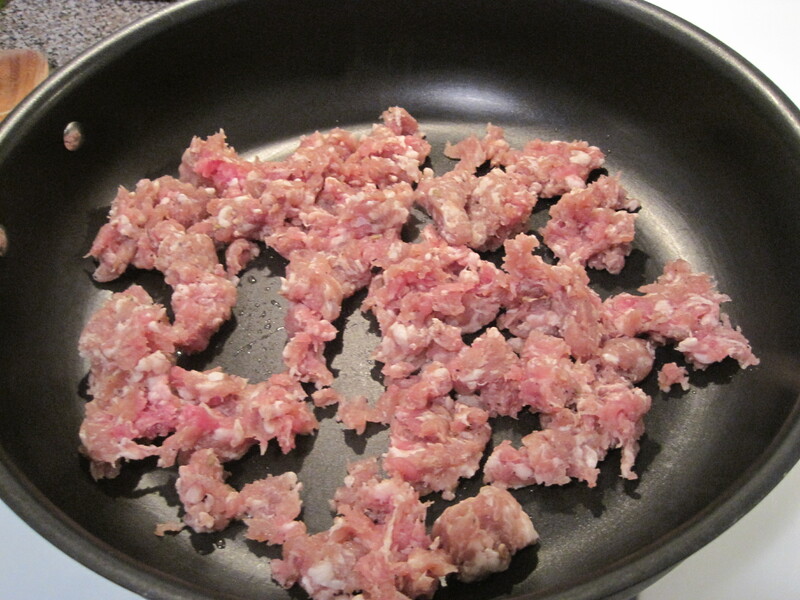 – Remove sausage meat from casings then crumble into the hot oil. 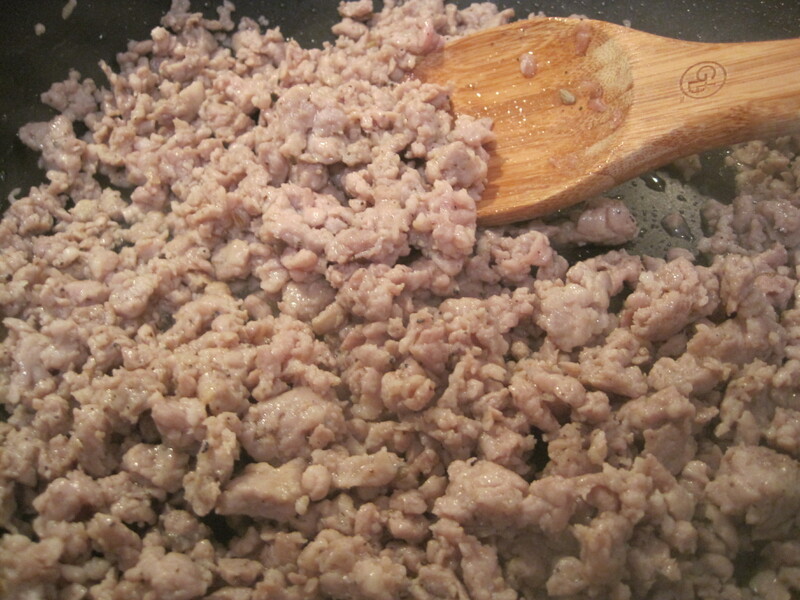 – Brown meat till cooked through then push the meat off to the side so one side of the pan is cleared. 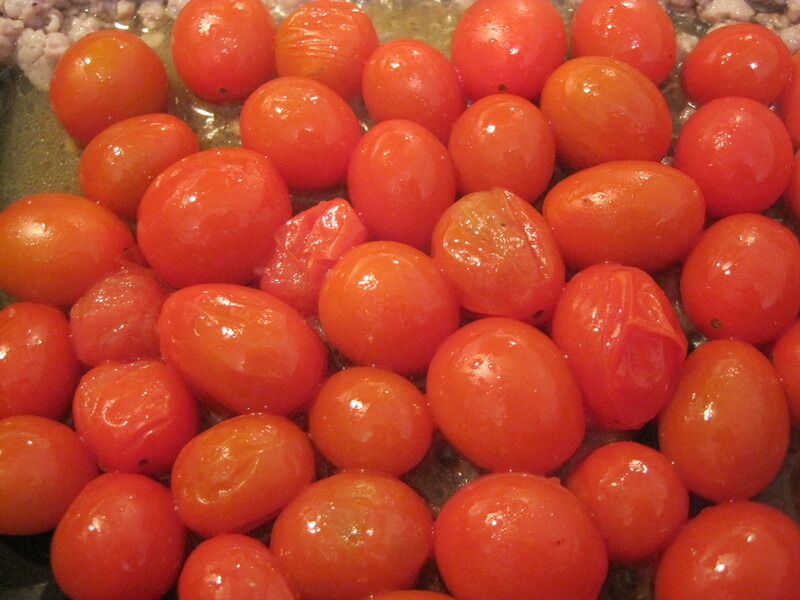 – Throw in the cherry tomatoes and let blister so juices go into pan. 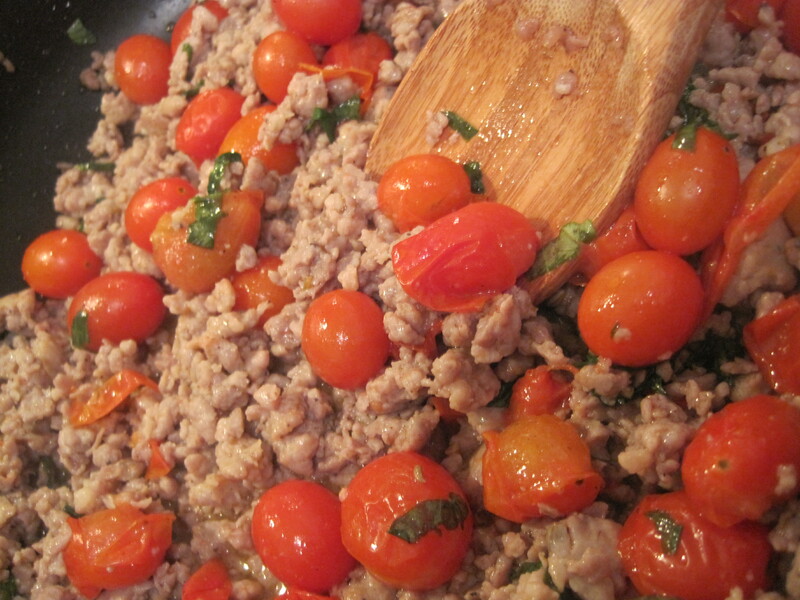 – You can now add in the white wine and the chicken broth along with the fresh basil leaves. – Combine all and season with salt, pepper and garlic powder. 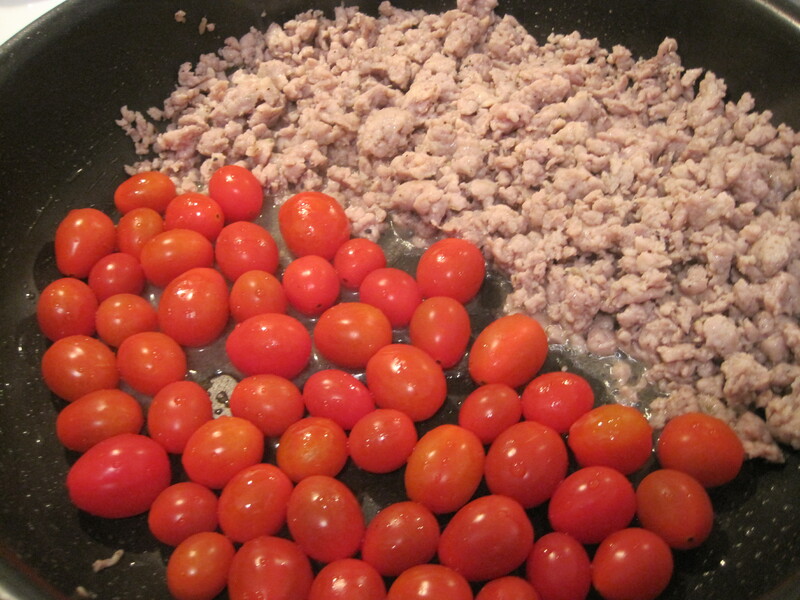 – Simmer on low till pasta is ready to be combined into pan. 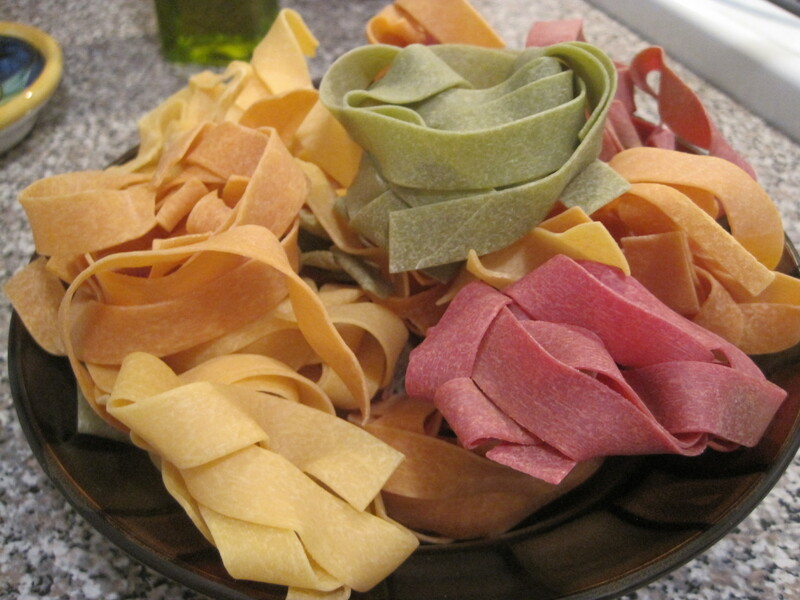 – Once pasta is cooked through, ladle one or two spoonful’s of pasta water into the pan. 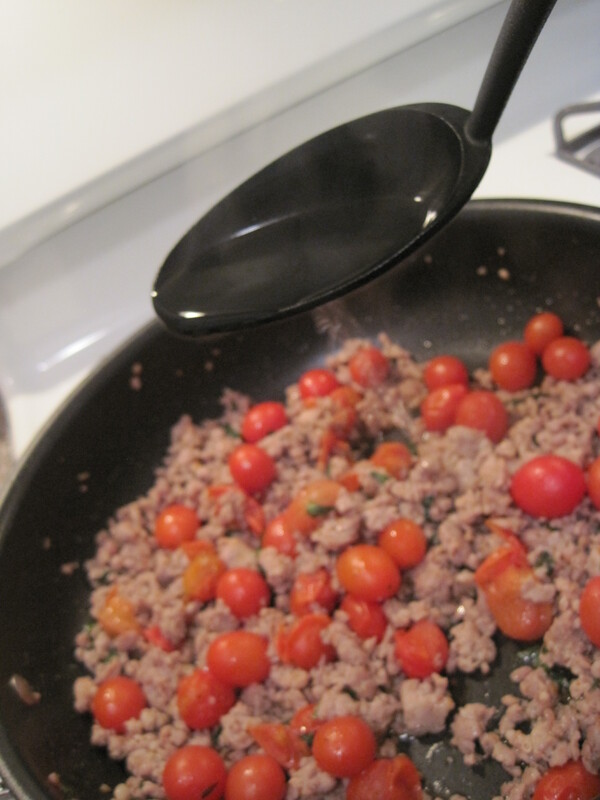 – Now drain the pasta and throw direct into the sauce pan. – Add a drizzle of olive oil season again with salt, pepper and garlic powder and mix. – Turn off the heat. – Plate pasta, top with feta and serve. *You can always use chicken sausage instead of pork sausage and even add other veggies to the tomatoes like mushrooms or green beans. © Cookery for Two – 2012 . Unauthorized use and/or duplication of this material without express and written permission from this blog’s author and/or owner is strictly prohibited. Excerpts and links may be used, provided that full and clear credit is given to Cookery for Two with appropriate and specific direction to the original content.